In recent years, green synthesis of silver nanoparticles (AgNPs) has gained much interest from chemists and researchers. In this concern, Indian flora has yet to divulge innumerable sources of cost-effective non-hazardous reducing and stabilizing compounds utilized in preparing AgNPs. This study investigates an efficient and sustainable route of AgNP preparation from 1 mM aqueous AgNO3 using leaf extracts of three plants, Musa balbisiana (banana), Azadirachta indica (neem) and Ocimum tenuiflorum (black tulsi), well adorned for their wide availability and medicinal property. AgNPs were prepared by the reaction of 1 mM silver nitrate and 5% leaf extract of each type of plant separately. the AgNPs were duely characterized and tested for their antibacterial activity and toxicity. The AgNPs were characterized by UV-visible (vis) spectrophotometer, particle size analyzer (DLS), scanning electron microscopy (SEM), transmission electron microscopy (TEM) and energy-dispersive spectroscopy (EDS). Fourier transform infrared spectrometer (FTIR) analysis was carried out to determine the nature of the capping agents in each of these leaf extracts. AgNPs obtained showed significantly higher antimicrobial activities against Escherichia coli (E. coli) and Bacillus sp. in comparison to both AgNO3 and raw plant extracts. Additionally, a toxicity evaluation of these AgNP containing solutions was carried out on seeds of Moong Bean (Vigna radiata) and Chickpea (Cicer arietinum). Results showed that seeds treated with AgNP solutions exhibited better rates of germination and oxidative stress enzyme activity nearing control levels, though detailed mechanism of uptake and translocation are yet to be analyzed. In totality, the AgNPs prepared are safe to be discharged in the environment and possibly utilized in processes of pollution remediation. AgNPs may also be efficiently utilized in agricultural research to obtain better health of crop plants as shown by our study. Indian greeneries are the chief and cheap source of medicinal plants and plant products. From centuries till date, these medicinal plants have been extensively utilized in Ayurveda. Recently, many such plants have been gaining importance due to their unique constituents and their versatile applicability in various developing fields of research and development. Nanobiotechnology is presently one of the most dynamic disciplines of research in contemporary material science whereby plants and different plant products are finding an imperative use in the synthesis of nanoparticles (NPs). In general, particles with a size less than 100 nm are referred to as NPs. Entirely novel and enhanced characteristics such as size, distribution and morphology have been revealed by these particles in comparison to the larger particles of the mass material that they have been prepared from []. NPs of noble metals like gold, silver and platinum are well recognized to have significant applications in electronics, magnetic, optoelectronics and information storage [–]. One such important member of the noble metal NPs are silver NPs (Ag NPs). They are also broadly applied in shampoos, soaps, detergents, cosmetics, toothpastes and medical and pharmaceutical products and are hence directly encountered by human systems [,]. Earlier, the antifungal properties of silver and silver nitrate were well incorporated in the field of medical science. Also, the medicinal importance of innumerable plants and plant parts were known. But the plant-mediated silver nanoproduct is a relatively newer concept. Nanobiotechnology and their derived products are unique not only in their treatment methodology but also due to their uniqueness in particle size, physical, chemical, biochemical properties and broad range of application as well. This current emerging field of nanobiotechnology is at the primary stage of development due to lack of implementation of innovative techniques in large industrial scale and yet has to be improved with the modern technologies. Hence, there is a need to design an economic, commercially feasible as well environmentally sustainable route of synthesis of Ag NPs in order to meet its growing demand in diverse sectors. Various approaches available for the synthesis of silver NPs include chemical [], electrochemical [], radiation [], photochemical methods [] and Langmuir-Blodgett [,] and biological techniques []. In this race of Ag NP preparation, plant-mediated green biomimetic synthesis of silver nanoparticle is considered a widely acceptable technology for rapid production of silver nanoparticles for successfully meeting the excessive need and current market demand and resulting in a reduction in the employment or generation of hazardous substances to human health and the environment. Studies have shown that Alfalfa roots can absorb Ag (0) from agar medium and are able to transport it to the plant shoot in the same state of oxidation []. Existing literature also reports successful synthesis of silver nanoparticles through a green route where the reducing and capping agent selected was the latex obtained from Jatropha curcas []. Ag NPs were also obtained using Aloe vera [], Acalypha indica [], Garcinia mangostana [] leaf extracts. Crataegus douglasii fruit extract [] as well as various other plant extracts [] as reducing agent. Here we have developed a rapid, eco-friendly and convenient green method for the synthesis of silver nanoparticles from silver nitrate using leaf extracts of three Indian medicinal, namely, Musa balbisiana (banana), A. indica (neem) and O. tenuiflorum (black tulsi), by microwave irradiation method. In this research, the plant mediated synthesized Ag NPs were characterized and studied in details with all of their properties significant to current science and prevailing technologies. The antimicrobial effects of leaf extract of these three medicinal plants and their respective biologically synthesized Ag NPs was evaluated by disc diffusion method. Comparative studies were also performed to analyze the toxicity of these biologically synthesized Ag NPs on two legume plants of the family Fabaceae, namely Moong Bean (Vigna radiata) and Chickpea (Cicer arietinum) as they are native to the Indian Subcontinent and widely consumed as pulses. Seeds were treated with four different concentrations of AgNP suspensions, to study the effect of the same on germination parameters and oxidative stress in the respective seeds. Discovering these new biological sources for synthesis of silver nanoparticles are more advantageous than contemporary physical or chemical procedures as these sources are abundantly available, cost-effective and conveniently utilizable. Results obtained from analysis of antimicrobial property and toxicity of these AgNPs ensure that they are safe to be discharged in the environment and hence fit to be applied for pollution remediation. Three Indian medicinal plants, M. balbisiana (banana), A. indica (neem) and O. tenuiflorum (black tulsi), were selected from West Bengal, India, on the basis of cost-effectiveness, ease of availability and medicinal property. Fresh and healthy leaves were collected locally and rinsed thoroughly first with tap water followed by distilled water to remove all the dust and unwanted visible particles, cut into small pieces and dried at room temperature. About 10 g of these finely incised leaves of each plant type were weighed separately and transferred into 250 mL beakers containing 100 mL distilled water and boiled for about 20 min. The extracts were then filtered thrice through Whatman No. 1 filter paper to remove particulate matter and to get clear solutions which were then refrigerated (4°C) in 250 mL Erlenmeyer flasks for further experiments. In each and every steps of the experiment, sterility conditions were maintained for the effectiveness and accuracy in results without contamination. Aqueous solution (1 mM) of silver nitrate (AgNO3) was prepared in 250 mL Erlenmeyer flasks and leaf extract was added for reduction into Ag+ ions for each type of leaf extract. The composite mixture was then kept on turntable of the microwave oven for complete bioreduction at a power of 300 W for 4 min discontinuously to prevent an increase of pressure. In the mean time, the colour change of the mixture from faint light to yellowish brown to reddish brown to colloidal brown was monitored periodically (time and colour change were recorded along with periodic sampling and scanning by UV-visible spectrophotometry) for maximum 30 min. This was separately performed with each type of plant extract. The reactions were carried out in darkness (to avoid photoactivation of AgNO3) at room temperature. Suitable controls were maintained all through the conduction of experiments. Complete reduction of AgNO3 to Ag+ ions was confirmed by the change in colour from colourless to colloidal brown. After irradiation, the dilute colloidal solution was cooled to room temperature and kept aside for 24 h for complete bioreduction and saturation denoted by UV-visible spectrophotometric scanning. Then, the colloidal mixture was sealed and stored properly for future use. The formation of Ag NPs was furthermore confirmed by spectrophotometric analysis. Samples (1 mL) of the suspension were collected periodically to monitor the completion of bioreduction of Ag+ in aqueous solution, followed by dilution of the samples with 2 ml of deionized water and subsequent scan in UV-visible (vis) spectra, between wave lengths of 200 to 700 nm in a spectrophotometer (Beckman - Model No. DU - 50, Fullerton, CA, USA), having a resolution of 1 nm. UV-vis spectra were recorded at intervals of 0 min, 15 min, 30 min, 45 min, 60 min and 24 h.
FTIR analysis of the dried Ag NPs was carried out through the potassium bromide (KBr) pellet (FTIR grade) method in 1:100 ratio and spectrum was recorded using Jasco FT/IR-6300 Fourier transform infrared spectrometer equipped with JASCO IRT-7000 Intron Infrared Microscope using transmittance mode operating at a resolution of 4 cm−1 (JASCO, Tokyo, Japan). Each of the colloidal solution containing Ag NPs were centrifuged at 4,000 rpm for 15 min, and the pellets was discarded and the supernatants were again centrifuged at 25,900 rpm for 30 min. This time, the supernatants were discarded and the final pellets were dissolved in 0.1 mL of deionized water. The pellet was mixed properly and carefully placed on a glass cover slip followed by air-drying. The cover slip itself was used during scanning electron microscopy (SEM) analysis. The samples were then gold coated using a coater (JEOL, Akishima-shi, Japan, and Model No. JFC-1600). The images of NPs were obtained in a scanning electron microscope (ZEISS EVO-MA 10, Oberkochen, Germany). The details regarding applied voltage, magnification used and size of the contents of the images were implanted on the images itself. Transmission electron microscopy (TEM) technique was used to visualize the morphology of the Ag NPs. The 200 kV ultra-high-resolution transmission electron microscope (JEOL, Model No. JEM 2100 HR with EELS). TEM grids were prepared by placing a 5 μL of the AgNP solutions on carbon-coated copper grids and drying under lamp. Additionally, addition presence of metals in the sample was analyzed by energy-dispersive spectroscopy (EDS) using INCA Energy TEM 200 with analysis software (JEOL) was used. The comparative antibacterial activities of the plant leaf extracts and of the Ag NPs synthesized from the respective extracts were effectively accessed against one Gram (+) ve (Bacillus) bacteria and one Gram (-) ve (Escherichia coli (E. coli)) bacteria as test microorganisms procured from IMTEch Chandigarh. Disc diffusion method [] was followed for testing each type of plant leaf extract and their respective Ag NPs containing solution. The discs were soaked with double distilled water, plant leaf extracts, silver nitrate solution and solution containing silver nanoparticles of each type separately. Then the discs were air dried in sterile condition. The plates containing nutrient agar media were prepared by swabbing them with the microbial cultures. Plates containing media as well as culture were divided in to four equal parts and previously prepared discs were placed on each part of the plate. The discs were placed in the following order: disc soaked with double distilled water as negative control, disc soaked with plant leaves extract, disc soaked with 1 mM silver nitrate solution and disc soaked with solution containing plant leaves mediated synthesized silver nanoparticles. The plates were incubated at 37°C for 24 to 48 h. Then, the maximum zone of inhibition were observed and measured for analysis against each type of test microorganism. Four different concentrations of (25%, 50%, 75% and 100% (v/v)) of three different Ag NP dispersions were prepared in distilled water. The germination test was carried out in sterile Petri dishes of 12 cm diameter by placing a Whatman® no. 3 filter paper on them. Fifty seeds of each receptor crop, Moong Bean (V. radiata) and Chickpea (C. arietinum), were placed in the respective Petri dishes. The seeds were surface sterilized with 0.1% HgCl2 solution and rinsed three times with distilled water. The solution of each concentration was added to each Petri dish of respective treatment daily in such an amount just enough to wet the seeds. The Petri dish were then placed in seed germinator in dark (Yorco Y58765) and maintained at 25°C. Seeds with root tip 1 mm and higher were considered as germinated. Percent germination and length of root and shoot (in mm) obtained following each 24 h up to 72 h after the germination of seeds was observed were calculated thereafter. Oxidative stress enzyme activities in root and shoot samples (l00 mg) from control and treated seedlings were precisely rinsed with distilled water and homogenized with cold phosphate buffer (0.1 M, pH 7.0) and centrifuged at 12,000 rpm for 15 min at 4°C. Pellets were discarded and the supernatants were further used for enzyme assay. The protein content of sample extracts was assessed using bovine serum albumin (BSA; Sigma Chemical, St. Louis, MO, USA) as standard protein []. Catalase activity (CAT) in samples was recorded as a decline in absorbance at 240 nm for 1 min and expressed as μmol H2O2 consumed min−1 mg−1 protein []. The substrate mixture consisting of phosphate buffer (50 mM) and H2O2 (15 mM) was added to the enzyme extract. Superoxide dismutase (SOD) activity was then assessed using nitroblue tetrazolium (NBT) in the presence of riboflavin []. Results were expressed as SOD units mg−1 protein. The reaction mixture was prepared by taking 50 μL enzyme extract and adding 1 mL NBT (50 μM), 500 μL methionine (13 mM), 1 mL riboflavin (1.3 μM), 950 μL (50 mM) phosphate buffer and 500 μL EDTA (75 mM). This reaction was started by keeping reaction solution under 30 W fluorescent lamp illuminations and turning the fluorescent lamp on. The reaction stopped when the lamp turned off 5 min later. The NBT photo reduction produced blue formazane which was used to measure the increase in absorbance at 560 nm. The same reaction mixtures without enzyme extract in dark were used as blank. Soluble peroxidase (POD) activity of the tissues was estimated by adding Guaiacol solution (0.25% guaiacol (v/v) in 10 mmol/L sodium phosphate buffer (pH 6.0) and 0.125% H2O2 (v/v)) to the enzyme extract. POD activity was recorded as the resultant increase in absorbance at 470 nm and expressed as ΔOD/min/mg protein []. All spectrophotometric measurements were done with UV-vis spectophotometer (Shimadzu UV -1601, Kyoto, Japan). Analytical determinations were made in triplicate. All experimental data are expressed as mean ± standard deviation. All the statistical analyses were carried out by using Origin software (version 7.0383; OriginLab Corporation, Northampton, MA 01060, USA). Statistical significance of the data were analyzed by two sample independent t tests and one-way ANOVA by using GraphPad InStat 3 (San Diego, CA, USA) with significance limit set at 5% probability. Silver nanoparticles (AgNPs) appear yellowish brown in colour in aqueous medium as a result of surface plasmon vibrations []. As the different leaf extracts were added to aqueous silver nitrate solution, the colour of the solution changed from faint light to yellowish brown to reddish brown and finally to colloidal brown indicating AgNP formation. Similar changes in colour have also been observed in previous studies [–] and hence confirmed the completion of reaction between leaf extract and AgNO3. The UV-vis spectra recorded after time intervals of 15 min, 30 min, 45 min, 60 min and 24 h from the initiation of reaction are shown in Figure 1. Absorption spectra of AgNPs formed in the reaction media has absorption maxima in the range of 425 to 475 nm due to surface plasmon resonance of AgNPs. The UV-vis spectra recorded, implied that most rapid bioreduction was achieved using banana leaf extract as reducing agent followed by tulsi and neem leaf extracts. This was denoted by broadening of the peak which indicated the formation of polydispersed large nanoparticles due to slow reduction rates [,]. The UV-vis spectra also revealed that formation of AgNPs occurred rapidly within the first 15mins only and the AgNPs in solution remained stable even after 24 h of completion of reaction. 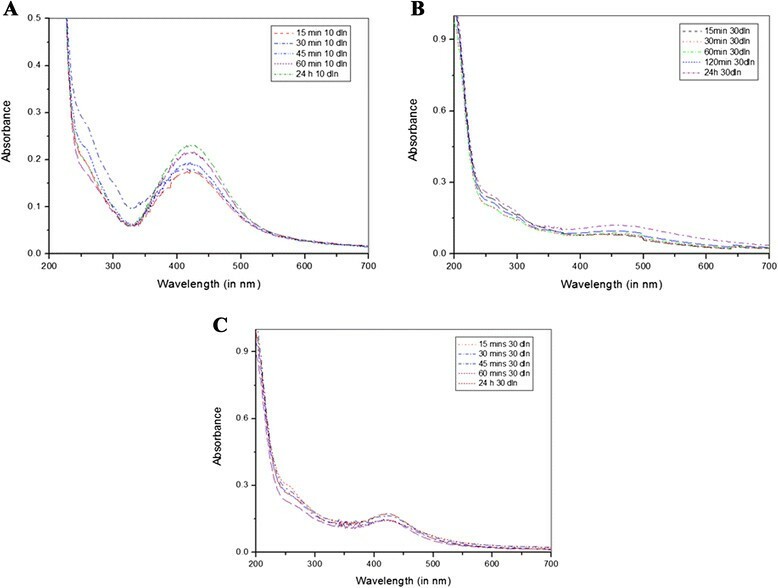 UV–vis absorption spectrum of silver nanoparticles. From (A) banana, (B) neem and (C) tulsi leaf extracts. 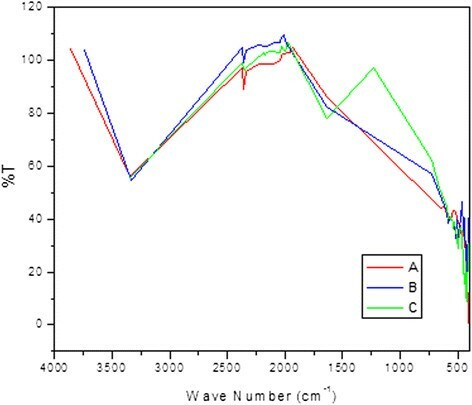 FTIR analysis carried out to characterize the AgNPs obtained from each type of plant extract (curve A, banana; curve B, neem and curve C, tulsi) is shown in Figure 2. In all three AgNP solutions, prominent bands of absorbance were observed at around 1,025, 1,074, 1,320, 1,381, 1,610 and 2,263 cm−1. The observed peaks denote -C-O-C-, ether linkages, -C-O-, germinal methyls, -C=C- groups or from aromatic rings and alkyne bonds, respectively. These bands denote stretching vibrational bands responsible for compounds like flavonoids and terpenoids [,] and so may be held responsible for efficient capping and stabilization of obtained AgNPs. Graphs obtained from FTIR analysis of AgNPs obtained. From (curve A) banana. (curve B) neem and (curve C) Tulsi leaf extracts respectively. The SEM images of the AgNPs are shown in Figure 3. It is seen that AgNPs of different shapes were obtained in case of different leaf extracts being used as reducing and capping agents. Banana, neem and tulsi extracts formed approximately spherical, triangular and cuboidal AgNPs, respectively. This may be due to availability of different quantity and nature of capping agents present in the different leaf extracts. This is also supported by the shifts and difference in areas of the peaks obtained in the FTIR analysis. SEM images of silver nanoparticles. Formed by the reaction of 1 mM silver nitrate and 5% leaf extract of (A) banana. (B) neem and (C) tulsi leaves respectively. 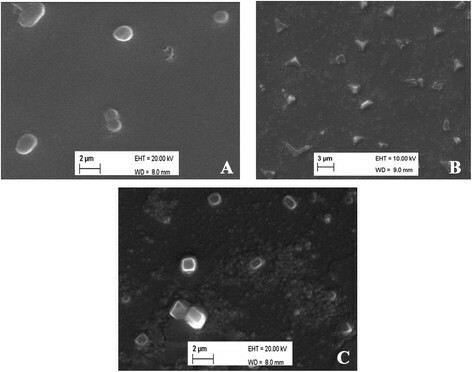 Figure 4 shows the TEM images obtained by the reaction of 5% of each type of leaf extract and 1 mM silver nitrate solution separately. A mixture of plates (triangles, pentagons and hexagons) and spheres was obtained though mainly spherical shapes were predominant. A similar trend is also observed in the SEM images (Figure 5). It is clear that the triangles, pentagons and hexagons are plate structures with sizes of up to 200 nm. 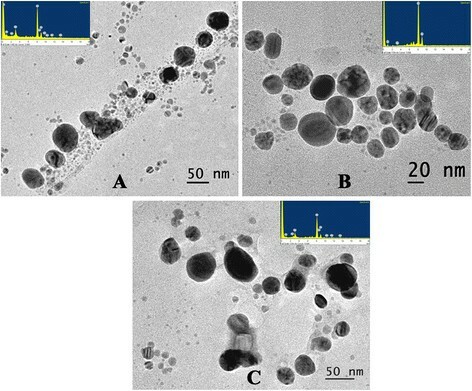 TEM images of silver nanoparticles. Formed by the reaction of 1 mM silver nitrate and 5% leaf extract of (A) banana. (B) neem and (C) tulsi leaves respectively. Effect of varying concentrations of AgNPs on Chickpea seeds. Solution A,B and C denote AgNPs prepared from banana, neem and tulsi respectively. Effect of AgNPs were observed on (A) percentage germination, (B) root length and (C) shoot length of Chickpea seeds. The EDS spectra recorded from the silver nanoparticles are shown inset Figure 4 (A, B and C). The EDS profile shows a strong silver signal along with weak oxygen and carbon peaks, which may have originated from the biomolecules bound to the surface of the silver nanoparticles. Carbon and copper peaks may be due to the same being present in the grids. It has been reported that nanoparticles synthesized using plant extracts are surrounded by a thin layer of some capping organic material from the plant leaf broth and are, thus, stable in solution up to 4 weeks after synthesis [,]. This is another advantage of nanoparticles synthesized using plant extracts over those synthesized using chemical methods. In this study, the antimicrobial property of AgNPs were investigated by growing Bacillus and E. coli colonies on nutrient agar plates supplemented with AgNPs. A control plate was separately maintained for both organisms in water. Results obtained are shown in Table 1. The inhibition zones obtained indicates maximum antibacterial activity of the prepared test sample. Results obtained in previous studies [,] also support the antibacterial potential of AgNPs. The zone of bacterial inhibition by AgNPs prepared from banana leaf extract show maximum inhibition for gm + ve Bacillus, which may be concluded from the fact that these particles had the smallest diameter than those prepared from neem and tulsi leaf extracts, which in turn exhibited equal antimicrobial property. Also, in comparison to AgNO3 and AgNPs, there is no such prominent antimicrobial activity in case of the plant extracts when used in crude form. No zone of inhibition was obtained in case of control. Cultures were treated with crude leaf extracts,AgNO3 and AgNPs. Results were expressed as Mean ± SD. Toxicity analysis of the AgNPs prepared was carried out on Moong bean (V. radiata) and Chickpea (C. arietinum) seeds and their resultant root and shoot lengths were recorded. Seeds were considered to have germinated by observing the emergence of radicles. Maximum percentage germination of seeds was obtained after 24 h. Results obtained varied significantly (p < 0.05) with each treatment. Chickpea seeds treated with AgNP solution prepared from banana extract (solution A) were significantly higher (p < 0.05) than those treated with AgNP solution prepared from tulsi extract (solution C), which were in turn significantly lower (p < 0.05) than those treated with AgNP solution prepared from neem extract (solution B). 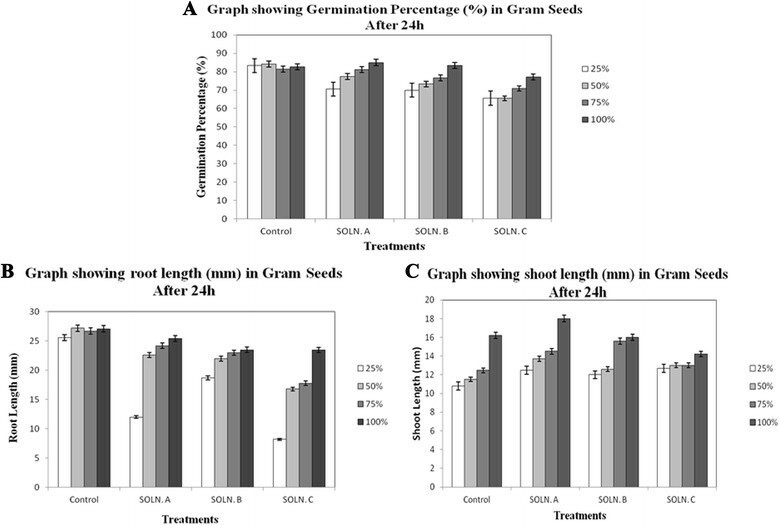 Root length and shoot length of seedlings were significantly higher (p < 0.05) than distilled water-treated controls in seeds treated with solution A, were lower than controls in seeds treated with solution B and were further reduced in seeds treated with solution C. Results obtained in case of Chickpea seeds are shown in Figure 5. Moong bean seeds also displayed a similar trend (figure not shown). Similar results were found [] in case of spinach seeds, where TiO2 NPs had induced germination and plant growth by altering the vigor of aged seeds. This was also accompanied by an increase in the root and shoot length and lower oxidative stress enzyme levels (discussed below). Peroxidases are those enzymes that catalyses dehydrogenation of large number of organic compounds like phenols, amines etc []. Spectrophometric analysis revealed that POD activity was significantly higher (p < 0.01) in AgNP-treated chickpea samples in comparison to the control treated ones. However, peroxidase activity was seen to augment with an increase in AgNP size and concentration. Increased peroxidase activity obtained in shoot and root tissues of chickpea seedlings exposed to solutions B and C may indicate an elevated level of ROS production in those organisms in comparison to that of the control and those treated with solution A. POD activity increased both in a time-dependent and dose-dependent manner. Two other enzymes, namely SOD and CAT are considered as first-defence system against oxidative stress whose activity may be altered by toxic stress. 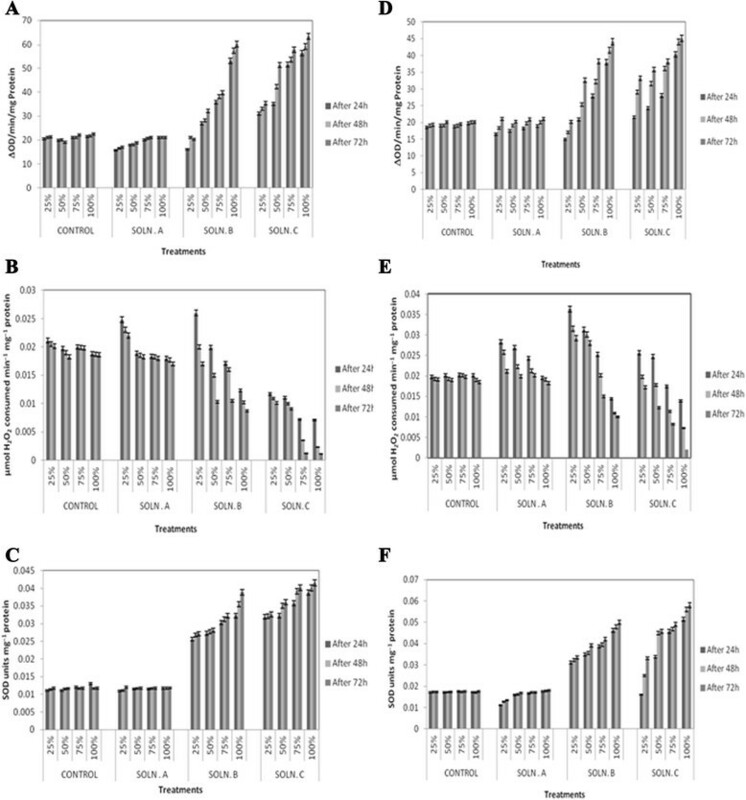 CAT activities significantly decreased (p < 0.01) while SOD activity in chickpeas was significantly elevated (p < 0.01) with respect to an increase in size and concentration of AgNPs. A succeeding increase in SOD activity supports the fact that suppression of CAT activity may be associated with a flux of superoxide radicals or inhibition of enzyme synthesis []. Changes in enzyme activities are shown in Figure 6. Similar results were obtained from Moong seeds as well (figure not shown). Dose and time dependant changes in peroxidase, catalase and superoxide dismutase activities. A-C denote enzyme activities in Chickpea roots respectively and D-F denote enzyme activities in Chickpea shoots respectively. Hence, a general pattern of increased health and growth was observed in seeds treated with solution A consisting of the smallest particles (80.2 nm) and was further affected with an increase in particle size. Oxidative stress was low and nearing control levels in both samples treated with solution A but appeared to undergo a significant increase with increase in concentrations of solutions B and C. These positive effects may possibly have occurred due to the antimicrobial properties of AgNPs, which can make plants strong and resistant to stress. At the same time, AgNPs, especially those with high specific surface area may be also be responsible for sequestering nutrients on their surfaces thereby serving as a nutrient stock to the germinating seeds and aid in their growth []. These results are also supported by other studies which have reported the antioxidant property [] and non-toxic nature [] of green synthesized AgNPs. Silver nanoparticles (AgNPs) were successfully obtained from bioreduction of silver nitrate solutions using banana, neem and tulsi leaf extracts. Owing to varying properties of these three plant species, AgNPs obtained from them also varied in size, the smallest being yield using banana leaf extracts. AgNPs have been appropriately characterized using UV-vis spectroscopy, SEM, TEM and EDS analysis. Results denoted banana leaf extract to be a better reducing agent in comparison to neem and tulsi leaf extracts. FTIR analysis revealed the efficient capping and stabilization properties of these AgNPs. Besides, they also aided in plant germination and growth by sequestering nutrients for them and could hence be implemented for agricultural purposes. Hence, due to their benign and stable nature and antimicrobial property, these AgNPs may be well utilized in industrial and remedial purposes. However, plant uptake and utilization of AgNPs require more detailed research on many issues like uptake potential of various species, process of uptake and translocation and the activities of the AgNPs at the cellular and molecular levels. The authors are thankful to all members of the Department of Environmental Science, University of Calcutta. We also acknowledge Mr. Tridip Sen, Miss Urmila Goswami, Center for Research in Nanoscience and Nanotechnology and Mr. Tanmoy kumar Dey, Laboratory of Food Science and Technology, Food and Nutrition Division, University of Calcutta, for helping us with SEM, TEM and FTIR analysis, respectively. PB carried out synthesis of AgNPs and helped in manuscript preparation. MS carried out characterization of AgNPs. AM helped in designing toxicity analysis. PD helped design the whole study and manuscript preparation. All authors read and approved the final manuscript.